Q. What t-shirts do you use? We use high quality 6.1 100% Cotton Ultra Cotton. They are a nice pre-shrunk heavy weight unisex tshirt. Q. What are the measurements of each size? (2000) - Adult T-Shirt 6.1 oz. (2000) - Adult Hooded Sweatshirt 7.5 oz. Q. 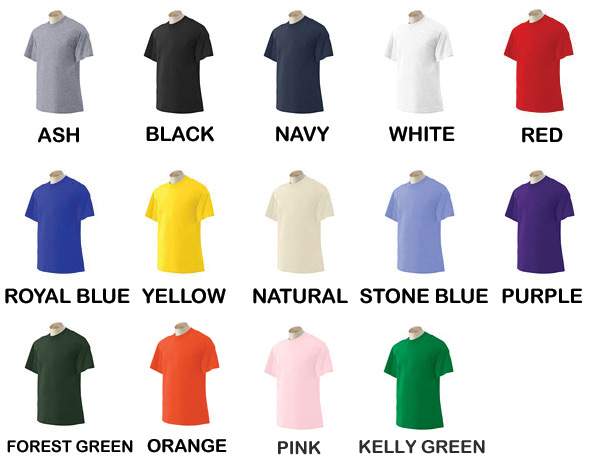 What do the t-shirt colors look like? We currently offer 12 colors for you to choose from. Here is an image of the different colors. Q. How do you ship the t-shirts? We ship orders via USPS Priority Mail in the US, and Global Priority Mail internationally. Priority Mail is fairly fast but not date specific. It usually gets to most places in the country in 2-3 days, but can take longer during the busy times of the year (i.e. Christmas). International Orders are shipped via Priority Mail(1 shirt) & International First Class (more than 2 t-shirts) depending on weight. Global Priority Mail (international orders) usually takes 7-14 days to most countries. However, shipping can take up to 2 weeks to pass through customs. Please, be patient, but feel free to contact us if you feel your package is taking longer than expected. We try our best to ship items within 2-3 days of ordering. Once your order is shipped it usually takes 2-3 days via Priority Mail and 7-14 days for international orders. Total turn around time is usually 4-7 days in US, and 7-14 days for international orders. We accept credit card, paypal, check and money order. When you are in the final checkout mode, you should see a lock shown toward the bottom of your browser. This means that the order is secure. This is only important when submitting credit card information. If you still don't want to enter your card online we offer a pay by mail option as well as credit card by phone ordering. Q. I ordered the wrong size. What do I do? All returns or exchanges must be made within 20 days from original order date. Please, include a note stating what size you would like to exchange for. It is best that your note be written on the original invoice that was sent with your order, but if you have misplaced the invoice, then any paper will do. We do require a $5.00 for US orders and $7.00 international reshipping fee. Please send $5.00 ($7.00 International) in cash OR check. We cannot charge the amount to you card, as we do not keep credit card numbers on file. Q. You sent me the wrong size, now what do I do? Simply inform us of the error (email: support at northshoreshirts dot com ) of the problem, and we'll correct the problem. If the mistake was clearly our fault then there is not need to return the item. We wouldn't mind if you did, but it's certainly not required. Q. I received by shirt, but I don't like it? What is your exchange policy? We accept returns of unworn resaleable merchandise with in 20 days of the original invoice date. There are no returns on custom design shirts, unless there is an obvious error made by us. Please, drop us an email before you return an item so that we know to expect it. No Returns/Exchanges after 20 days of the original invoice date. If you would like to exchange a shirt please include $5.00 ($7.00 for international orders) for return shipping. If you are simply returning the shirt for a refund please include a note with your return stating that you would like a refund. Once, the item is received we will issue a refund for the cost of the items ordered. We are unable to refund for the cost of shipping. Q. Do you sell women's fitted or child sizes? Sorry, we do not carry women's fitted t-shirts or children sizes at this time. How do I apply my vinyl sticker? Here's a special Vinyl Decal Sticker Application page. It should answer all your questions.